Elsewhere and earlier, we learned from Wired that, should dictators cut off their country from the internet, there are ways to restore connectivity to the populace. The U.S. military, for instance, has converted a cargo plane into an “airborne broadcasting center,” which “hypothetically” can boost Wi-Fi bars in bandwidth-denied areas to full strength. Any of the military's aircrafts can be converted into “cell towers in the sky” by attaching cellular pods to their wings or bellies. To this arsenal, one can supposedly add the above flying robots. When the switch is turned off, they'll be released from their roost to swarm over revolutionary spaces to churn up an electromagnetic storm of Facebook schedules, retweets and Anderson Cooper's adoring visage. But instead of hovering over disaster and conflict areas, how about urban and rural dead zones or in even more remote locales? 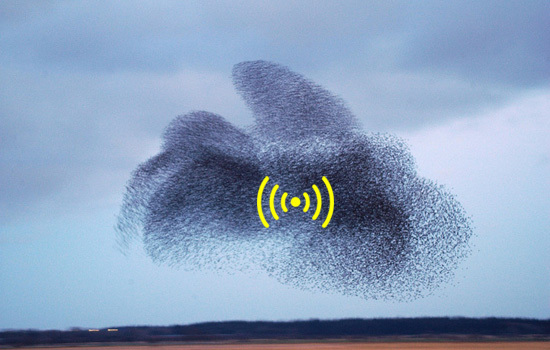 And instead of drones and toy airplanes, you conscript pigeons, starlings and other flying weeds into a wi-fi network of cyborg fauna? This network needn't be online all the time. The birds, after all, need some rest. So you simply let them loose, say, during rush hour to temporarily augment the network. One imagines urban homesteaders converting a water tank into an aviary for their robo-starlings, next to their urban apiaries, urban chicken coops and urban farming tool shed. When they need to communicate with other urban homesteaders, either nearby or in another Detroit-like ruin pornscape, they only need to open the hatch. It's an artisanal wi-fi for networked off-grid living. 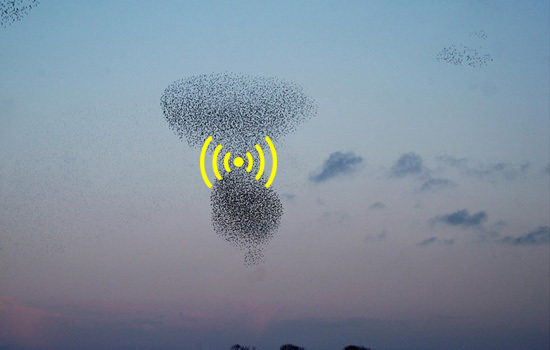 In order to lessen e-waste, each starling is equipped with a homing beacon, which will signal home should the animal die in flight. The homesteader simply has to trace the electronic beeps to collect the carcass and its outfittings. In the meantime, the beacon will be powered by the decaying organic matter.